When the beer is named Death By Hops, it might cross your mind that your taste buds are about to be sanded off your tongue. Or, if you’re like myself, you instantly start expecting a treat. Today’s beer comes from the Olde Hickory Brewery, located in Hickory, North Carolina, at the foot of the Blue Ridge Mountains. Anyone who reads this website with any regularity will know this is a local brewery for me. Founded in 1994 by Steven Lyerly and Jason Yates, production started on a seven barrel system and quickly outgrew, forcing upgrades. Olde Hickory isn’t a giant mega brewery, instead choosing to make beer in small batches, 800 gallons or less at a time. (Just to show how “small batch” Olde Hickory are, my bottle of Death By Hops has a hand marked “enjoy by…” date.) Distribution for their beers seems to be limited to Tennessee and North Carolina, so this one might be hard for most of my readers to find. 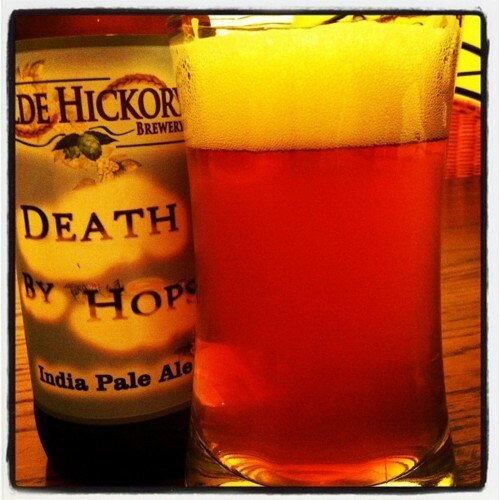 Death By Hops was the first Olde Hickory ProAm winner, which is a homebrew competition. This beer uses 71 pounds of high alpha hops in each batch, is fermented to 7% ABV (alcohol by volume), so this one is considered an Imperial. This beer is hopped with five different types of West Coast hops (Chinook, Columbus, Simcoe, Centennial, and Cascade) and is then dry-hopped twice. 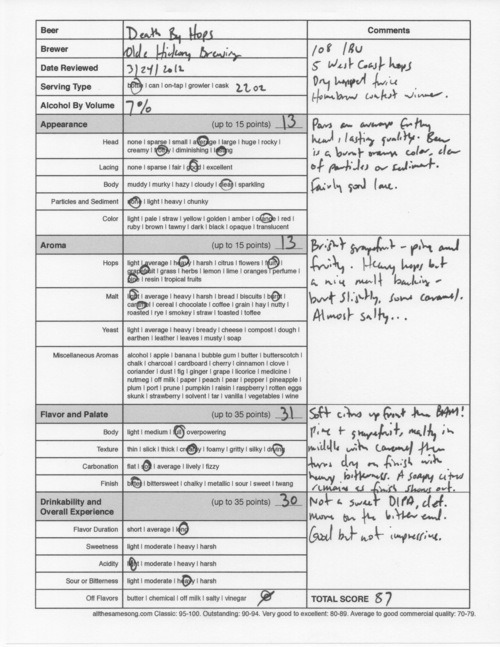 And get your tongue ready: we’re talking 108 International Bitterness Units (IBUs) here. The pour produced an average size, frothy head that had a lasting quality. 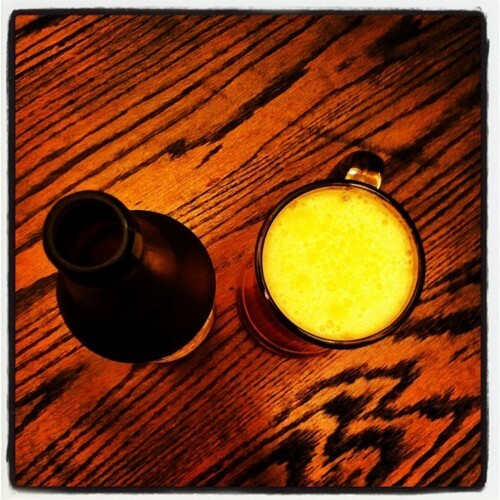 The beer was a burnt orange color, clear of particles or sediment. Lacing left behind was of good quality, with several tacky sheets stuck to the glass. A classic Imperial IPA appearance. The aromatics featured a bright grapefruit note, coupled with a layer of pine and general fruitiness — think Fruity Pebbles cereal. There’s heavy hops here but there is a nice malt backing, a slightly burnt aroma also that features a sweet note of caramel. Oddly enough, the whole thing has a sort of cracker-like saltiness to it. On the sip, things start cracking with a very soft citrus flavor, then WHAM! The taste buds are destroyed with a double team of pine and grapefruit, which turns malty in the middle with some sweet caramel, then quickly turns very, very dry and heavily bitter on the finish. There’s a soapy citrus at the end, coupled with a mouth drying crushed aspirin-like aftertaste. Unlike some Imperial IPAs that are sweet, this one is not. It is a bitter bomb. At 108 IBU, that is to be expected — but the bitterness honestly overwhelms things here. This is a good but not impressive beer. Death By Hops? The average drinker will be offended by this one. But for the hop head, you should be curious enough to try it. The flavors showcased — especially the grapefruit, pine, and caramel — were very nice, but as I got further into the drink, the bitterness started to mask those tasty qualities. 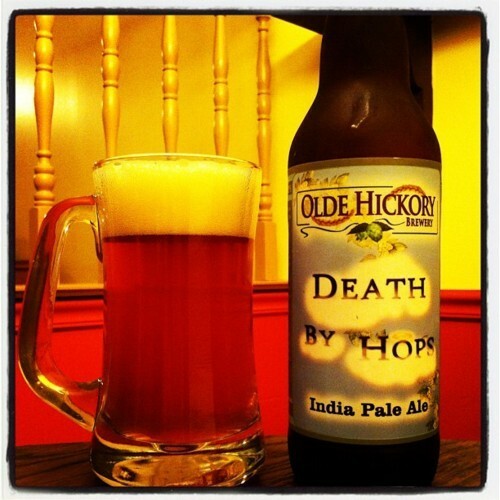 Olde Hickory Death By Hops, 87 points. Price: $5.99 US for one 22 oz. bomber size bottle.